At the time of the launch of the Children's Series in 2016 AIMS President Hiroaki Chosa said “Many great athletes have often emerged against great adversity. 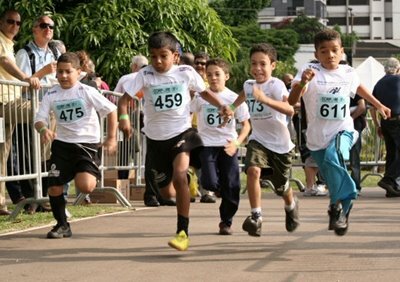 We are seeking to encourage more young children to follow their dreams and to aim for a healthy life.” The intention was to support races in poorer countries since a number of big international races in wealthier countries had already developed children’s races alongside their own events. The member races involved in this pilot project were the Sahara Marathon in Algeria, the Kathmandu Peace Run in Nepal and the Great Ethiopian Run in Addis Ababa. Quito, Ecuador: The chasquis were barefoot running messengers during the Inca civilisation. The second edition of the AIMS Children’s Series Quito was held in honour of these ancestral characters with the title ‘Chasquisito’. On the morning of 17 June in the “southern tribune”, one the most deprived areas of the city, 1000 children from all over the country experienced an athletic festivity along with their parents and friends. The objective was to create future star athletes that could represent Ecuador internationally and the satisfaction of encouraging a healthy and productive lifestyle through running. 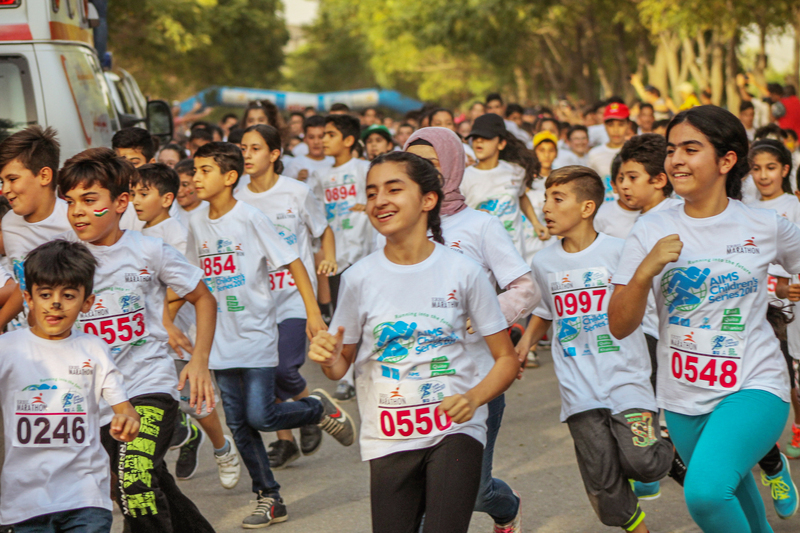 Erbil, Iraqi Kurdistan: On 28 July Erbil Marathon staged the 2018 AIMS Children’s series race. More than 1000 boys and girls aged from 6–13 ran in a 2km race which took place in the Sami Abdulrahman Park — the biggest park in Erbil (formerly an army base). After last year’s race the children, parents, media and others eagerly anticipated the event. Far more children applied but entries had to be capped at 1000. Fortunately, even those unable to register came to watch with their parents and joined in the fun. 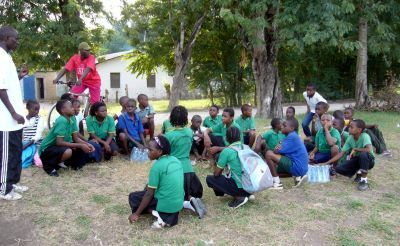 The children were very excited to receive a T-shirt, Cup, sports bag and other gifts provided by the sponsor company. Many of them received their first ever medals. 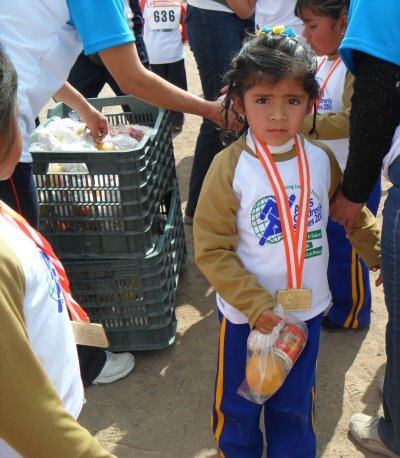 Water was provided all around the course and the children received milk and juice at the finish. There were activities before and after the race such as face painting, warming up and dancing with cartoon characters and clowns. Several Government officials attended the ceremony including the deputy Governor of Erbil. There was coverage from local and national media agencies including the children’s channel JOJO MAMA who were event partners and aired several reports before and after the event to build awareness. 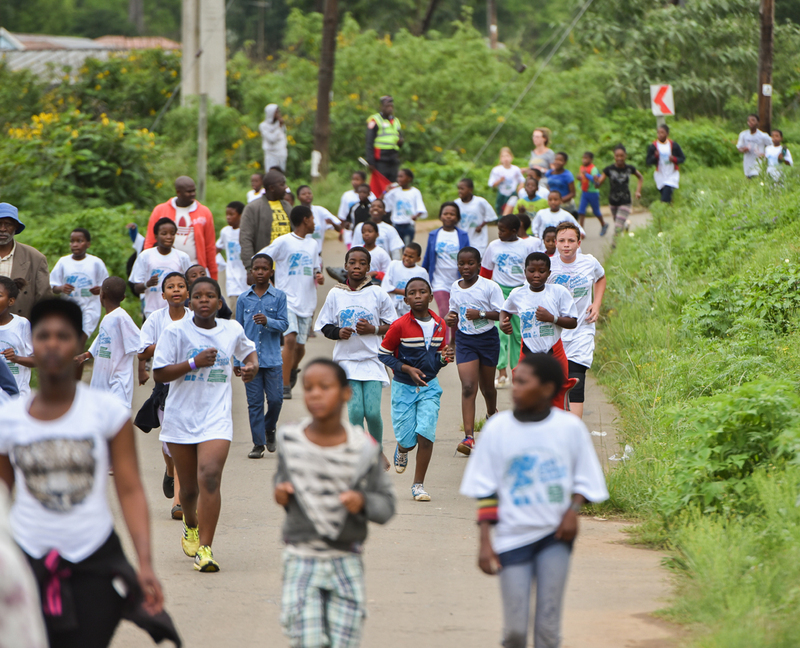 The final AIMS Children’s Series race to be held in Pietermaritzburg, KwaZulu-Natal was staged on 13 November from the FNB Wadley Stadium in Edendale, a township in the city of Pietermaritzburg. The race coincided with the 10th Greater Edendale 10km road race and both were organised by the Comrades Marathon Association as part of its Corporate Social Investment Initiative. Close to 2000 children between the ages of 9 to 15 from schools around the township took part. 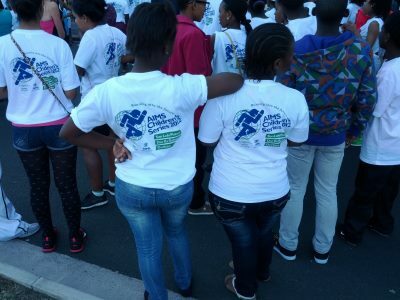 They ran proudly for 5km along the streets of Edendale and for many it was their first experience of a road race and for nearly all it was the first time that they had received a t-shirt and a medal for doing so. As they finished the race they were applauded by the runners who had run the 10km and many community members who came to support the event. Well after the race kids from the township could still be seen wearing their AIMS CHILDREN SERIES t-shirts with pride and with their medals hanging around their necks. The Comrades Marathon Association handed two electronic prizes to the two schools that brought the greatest number of school kids to participate in the event. The school kids also had an opportunity to win individual lucky draw prizes. On behalf of all the children, the Comrades Marathon would like to thank AIMS for the noble idea of the AIMS Children’s Series race. Events like this go a long way in motivating kids to take up the sport of athletics. It is from these grass root events that future champions grow. The final AIMS Children’s Series event to be held in Zimbabwe took place on 17 September at Riversdale School in Featherstone. School staff assisted the organisers from the Women’s International Fellowship (WIF). Last year’s event raised sufficient funds to cover the installation of a borehole which has significantly improved the quality of drinking water and given the school a much more established feel to it. 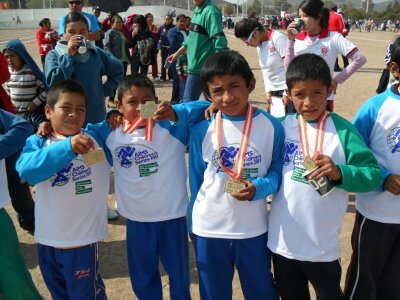 All the children who participated received T-shirts and medals and winners were given trophies. A locally-recruited sponsor, NetOne (a telecommunications operator) gave the senior school runners pens as gifts. Overwhelming demand required T-shirts to be given to all children participating in the events of the day, including the choir, culture club and catering. For the senior school races were split between boys and girls but some of the primary school races were mixed. The longer races had to be held promptly to avoid the heat of the day. Races ranged in length from 100m for under-9s to 3km and 7km for over-14 girls and boys respectively. In all nine separate races were held. In between the races the children provided entertainment through the well-rehearsed choir, the Drama Club, cultural dances and poetry recital (which included hip-hop). Activities were rounded off with a tug of war. The race has become the key event on the school calendar, with proceedings funding building renovations and additions. The races have inspired the development of sport in the school. They have introduced more sports into their curriculum and currently play handball, netball and soccer with cricket and rugby likely to follow. The event was dedicated to WIF founder and visionary Jane Aichi Olamikun Banjo who fell ill during the 2015 races and eventually died in October 2015. The races were a fitting tribute to her legacy. Events in the 2017 series will be held in Khanivali (IND) and Quito (ECU) during June and in Erbil (IRQ) in October. 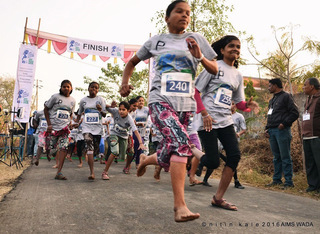 The first AIMS Children’s Series race of 2016 was held on 24 January in the village of Khanivali, 80km north of Mumbai, the first time the Series has ever hosted an event in India. Just under 500 children from the Anand Laxman Chandavarkar Vidhyalay secondary school participated in a 4km fun run. 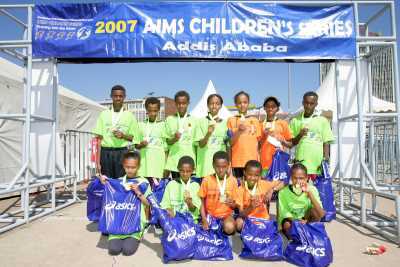 AIMS launched the Children’s Series in 2006 to assist selected member races in promoting running among children in areas of need. The school, attended by children from mainly farming families, hosted boys’ and girls’ races for the eighth, ninth and tenth grades. The children raced over a traffic-free out-and-back 4km course on mainly tarmac road. The gently downhill first kilometre to the bridge over the river made for some fast starts. The girls’ races were set off five minutes after the boys so that there was only limited overlap and the interval between age groups was sufficient to allow almost all the field to have completed before the next race followed. All completed the course and some with impressive timings, the fastest of the day being 14 minutes 27 seconds. Comprehensive chip-timed results were available following the race. There was a good incentive to run fast as the first three in each category – 18 in all – were awarded with bicycles and a pair of branded running shoes. AIMS Secretary Hugh Jones attended and assisted with the prize giving. All those who ran received probably the most goody-laden finisher bag ever offered anywhere: the bag itself was a canvas school backpack and it contained a blanket, cap, water bottle, pens, crayons, notebook and maths instruments as well as a skipping rope and two rubber balls, packets of food and toiletries. And that wasn’t all: along with the finishers’ medals and certificates everyone received a personal Fuji Instamax Polaroid of them with their medal, an analogue watch, a pair of canvas shoes (the children had been individually measured up the previous week) and two pairs of socks. Race director Amit Sheth, who had recruited an organising team including the school staff, members of the Inner Wheel Club of Bombay Sea Coast, the Borivali National Park Green Runners from north Mumbai and a wide range of family and friends, was pleased with how the race went. The other 2016 AIMS Children’s Series events are scheduled to take place in Ecuador and South Africa. 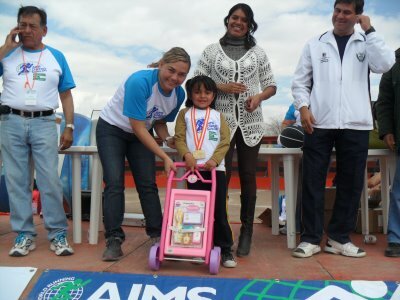 The AIMS Children's Series race held on 3 August in Asuncion proved stiff competition for the title event, the Maraton International de Asuncion held the following day writes AIMS President Paco Borao. 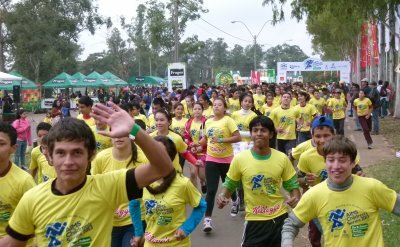 1500 children from the age of six to 16 filled the Ñu Guazu Park in the biggest ever running festival held in Paraguay. 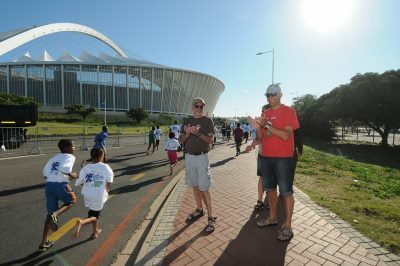 The first edition of the AIMS Children's Series to be held in South Africa took place in Durban on 2 June 2012. Organised by the Comrades Marathon Association with the support of the KwaZulu-Natal Department of Sport & Recreation, it was the third event of the 2012 series. The event had an international flavour as part of the AIMS Children’s Series and drew enthusiasm from the various school districts of KZN. Participants were transported by bus from as far as 200km away from Durban. 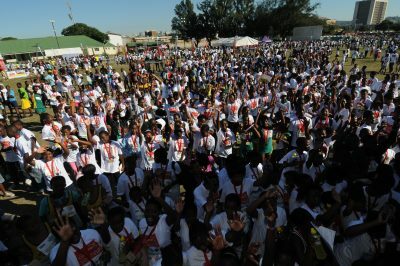 Over 5000 children completed the 10km and 5 km races respectively. 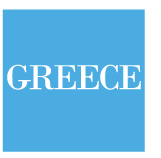 The race was attended by provincial and national government officials. Miss South Africa, Melinda Bam, assisted with the prize-giving ceremony after the race. The children were very proud of their medals: every finisher received a medal, and every entrant a T-shirt. The Comrades Marathon Association used the race to highlight the importance of creating opportunities for youth to participate in accessible road races so as to build the culture of physical activity and organized sport in the community. Staging this race in South Africa has elevated the CMA and AIMS as important partners in children’s sport in South Africa. 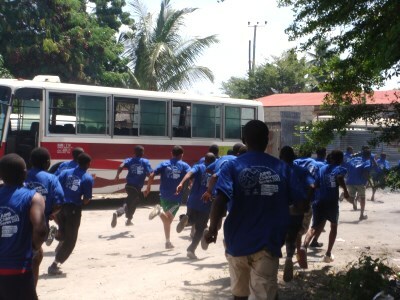 The second edition of the AIMS Children's Series to be held in Tanzania took place on 21 April 2012, starting and finishing at the Tushikamane Care secondary school in the Tabata County district of Dar Es Salaam. The under-13 girls opened proceedings, followed 15 minutes later by the under-13 boys. The under-17 races followed. 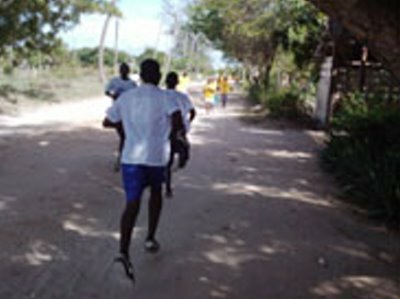 There were 400 runners, all orphans and children living in difficulty, recruited from schools around the locality. 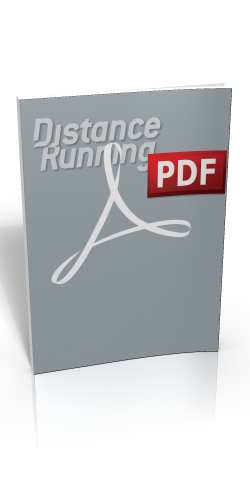 They ran in under-17 and under-13 age categories for both boys and girls. Boys wore blue round neck AIMS t-shirts and girls wore white round neck AIMS t-shirts. After the race the children were provided with refreshments and served a buffet lunch. 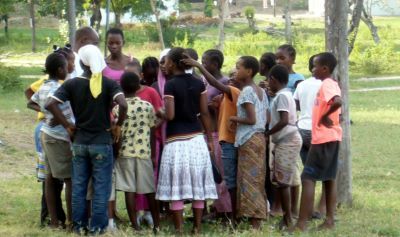 The event was coordinated between Infosol Tanzania and Tushikamane Children’s Care Trust Fund. The organizing team involved 20 teachers recruited from all nine schools involved, 2 nurses, 10 Traffic police, 10 security personnel and 2 doctors. e Children's Series events are helping to bring unity to the world through a common language: that of “RUNNING”. This experience will last forever in the hearts of the children and the sport of running will become part of their lives. 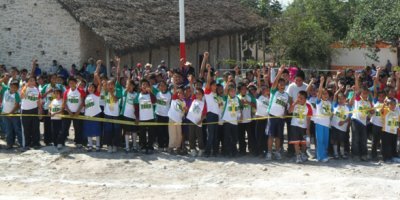 The third and final edition of the AIMS CHILDREN'S SERIES 2011 held in San Luis Potosi, México was postponed and actually took place on 31 January 2012, with almost 1,000 children participating,, The event was staged in the municipality of Villa de Reyes, 100km away from the state capital of San Luis Potosi. The purpose of the series was achieved: the sport of running has crossed a boundary in Mexico, as the race made a sporting impact on the community and the series will continue to be organized locally. 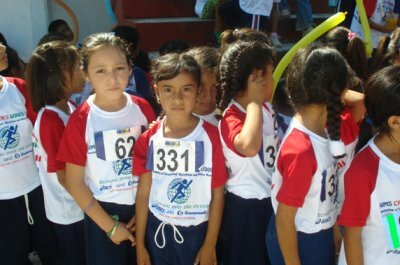 The children have come to know the feeling of running and begun to enjoy the sport along with their parents and teachers. This Series is likely the beginning of many races to be held in the future, thanks to AIMS, to its members and to the sponsors who made this dream possible. 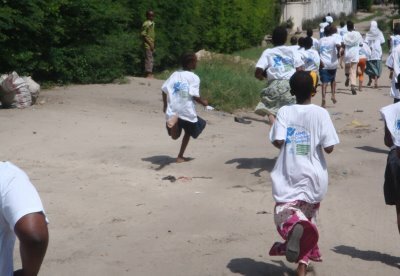 AIMS held the first race of the 2011 AIMS Children’s Series in Bagamoyo, near Dar Es Salaam in Tanzania, on Saturday 2nd April. The event welcomed over 400 runners between 5-17 years of age and was hailed as an overwhelming success by all involved. 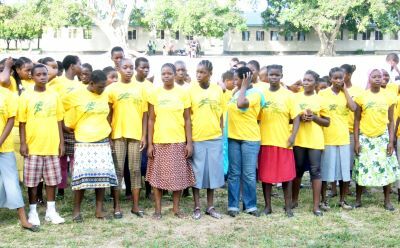 Children were recruited from eight primary and secondary schools in Bagamoyo town and surrounding district then split into sections of boys and girls and divided into categories aged under 13 and under 17. Local primary school, Mwanamakuka, provided the starting point and finishing line for all races. AIMS supplied T-shirts and medals to all those participating and prizes were awarded for the top finishers in each age category. AIMS would like to thank its partners ASICS and especially its local partners Infosol Tanzania and Bagamoyo District Council under the District Council Sports coordinator. Special thanks and acknowledgement also goes to the teachers from the schools involved, Bagamoyo District Hospital and the local Police Department. A total of 1100 children from 16 different native communities participated, made possible by the Education Secretariat of the State. 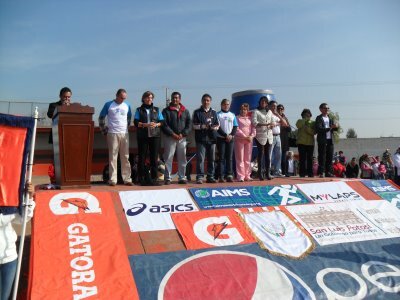 The event was organized by the Association of International Marathons and Distance Races (AIMS) in association with Tangamanga Marathon and the State Government of San Luis Potosí. 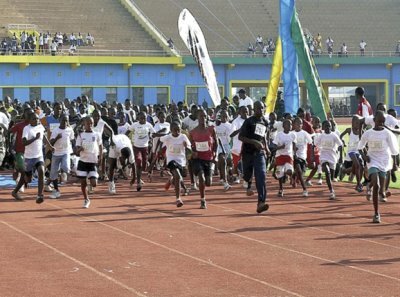 The second race of Children Race Series 2010 was held on Saturday 22 May at the venue of Amohoro Stadium in Kigali. 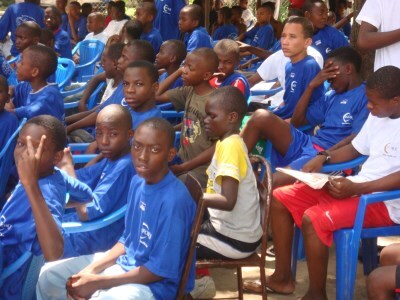 Despite delays in the process the organizers registered 2387 children aged from 10 – 14 years. 1235 boys and 1152 girls entered, most of them via the 24 primary and secondary schools in central sectors of Kigali City. Others schools and Soroptimist clubs from northern and east province were enthusiastic and traveled over 240km with the children, spending the weekend in Kigali. 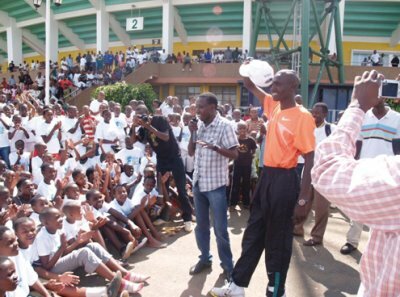 On Saturday 22 May from 08.00–09.30, the meeting area called ‘Petit Stade’ was crowded with children meeting their teachers and with volunteers and helpers from the Athletic Federation distributing the AIMS T-Shirts. 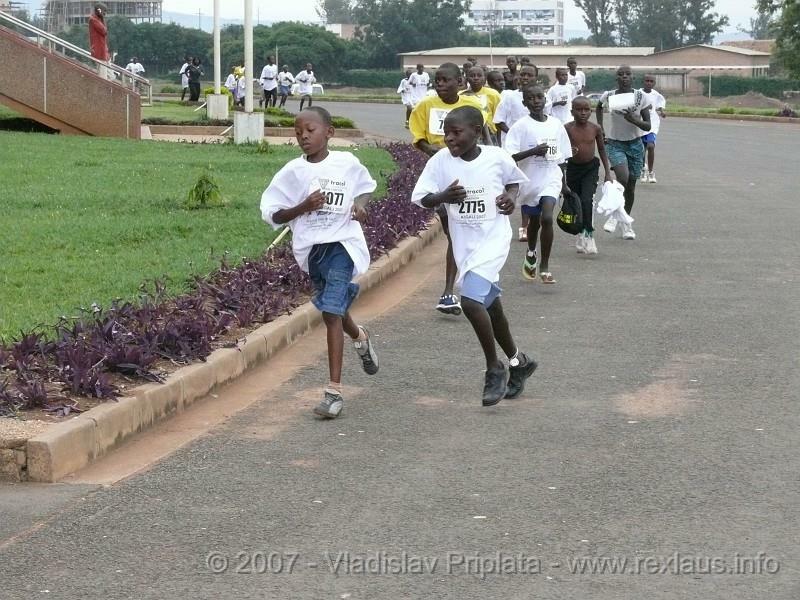 A highlight of the Kigali AIMS Children’s Race was the presence of top athletes. Thanks to the financial support of MINISPOC, IAAF Athletes representative Benjamin Limo (Kenya) was invited. 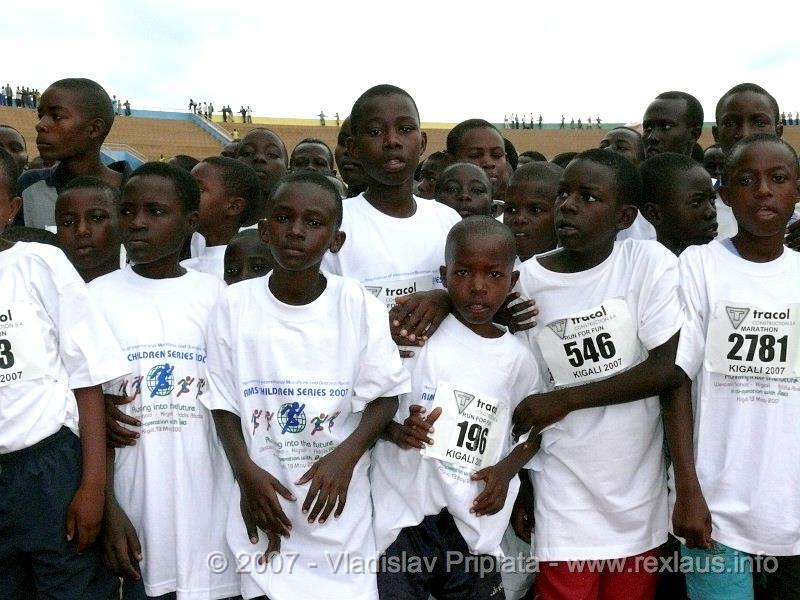 Together with local top runner Dieudonne Disi (still injured) and Grant Robinson (who visited the country with friends) they encouraged children before the race start. At the finish, AIMS Medals and refreshments were given to the children – although a bit stressful and overcrowded due to “relaxed” security. On Sunday 23 May, thanks to support of ASICS, the top Children’s finishers were presented with their awards at the official prizegiving of the International Peace Marathon 2010. 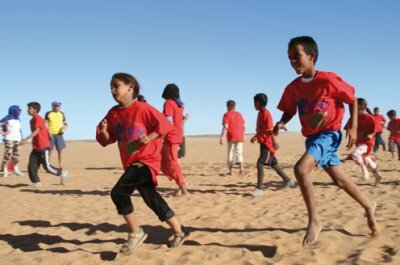 The first race of the AIMS Children's Series 2010 took place in Western Sahara, at the Dakhla refugee camp on 25 February, celebrating the final edition of the series in this venue; the Children´s Series is a social program that lasts 3 years in each location; by that time it is expected that the organization is ready to continue the organization by themselves and the seed of running has been planted. The scene is within a refugee camp in the Sahara Desert; Dakhla is one of four such camps in south western Algeria. Held on 25 February, three days after the Sahara Marathon was run between other three camps, the conditions could hardly have been less favourable, with temperatures in the Dakhla camp reaching 40°C earlier in the day. A thousand children marched down the long straight to the start of the half dozen races, which ranged from 300m for the youngest to 1000m for the early teenagers. 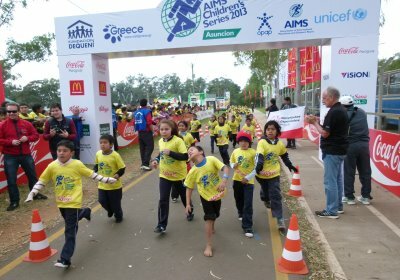 In 2009 the AIMS Children's Series brought thousands of children on two different continents together to run and have fun at the same time. Through the Series AIMS brings the sport of running to the farthest communities and promotes running in needy areas where otherwise little financial support for sport is received. This has been made possible thanks to our partners ASICS, TOKYO MARATHON and the local partners. Thanks A Lot for making a difference to these children’s lives. Originally scheduled for 27 August, the Mexican event was postponed to 2 October. By this time children were back in their classes and had some time in which both their teachers and they themselves could prepare for the race. 1200 mainly indigenous Indian children took part in six age categories: 5-6, 7-8, 9-10, 11-12, 13-14 and 15-16 years old. 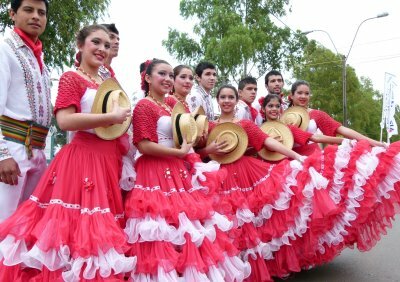 They came from 16 different indigenous communities from the Santa Catarina district to take part and thoroughly enjoyed themselves. Each age group was indicated by a different coloured strip on their sleeves. All were winners, just through participating and being given a chance to show their skills. The AIMS Vice President Paco Borao assisted, commenting: "It was a very good choice to put this event on in Santa Maria Acapulco". 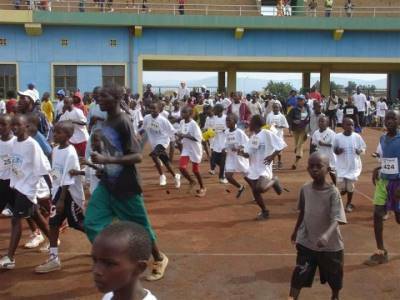 The Kigali Peace Marathon took place in the Rwandan capital on 24 May with the participation of 2000 children, starting and finishing their 5km run inside the National Stadium. The event was held on 3 April during the AIMS Congress in Sao Paulo. The races were for young children and over a distance of only 200m. Continuous “waves“ of half a dozen children at a time were set off on the tarmac racetrack. AIMS President Hirokai Chosa acted as official starter and AIMS delegates assisted in proceedings. 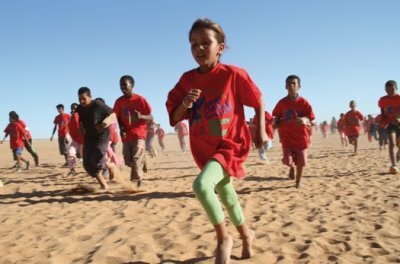 The AIMS Children's Series 2009 opened with races held alongside the Sahara Marathon on 23 February. Mattia Durli reports: "So as not to exclude anyone we had two different children's races in the two camps where we stayed, including the Dhakla refugee camp where it was held for the first time." 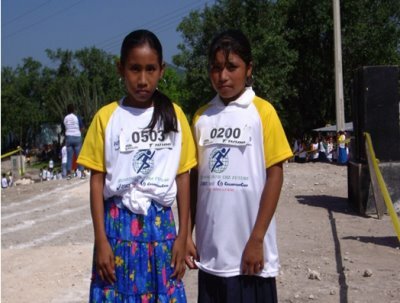 The marathon was held in Smara, and the organization integrated the Camp within the marathon program. Runners from many different countries attended the marathon. 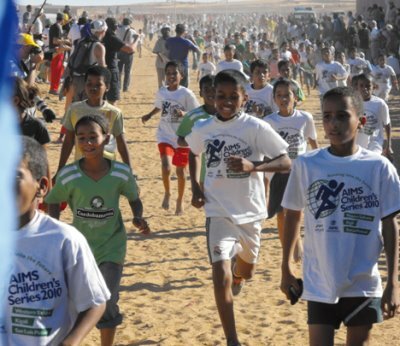 The children's race took place in Dakhla, 3 hours by car from Smara. Around 1000 participated in the race, having a great time and receiving a beautiful medal and a t-shirt. 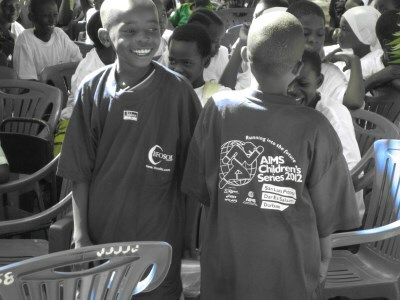 The AIMS Children's Series 2008 came to a close with the final event of the programme in Addis Ababa on 22 November. 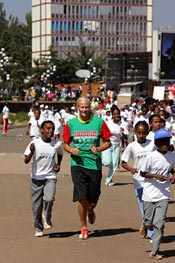 Races for boys and girls in under-8 and under-11 categories were run around Meskal Square in the Ethiopian capital. 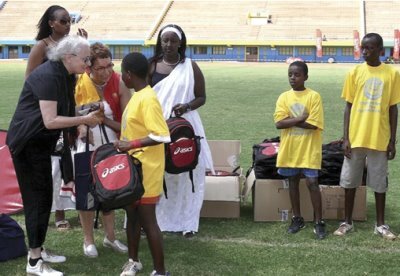 About 3000 children participated with great enthusiasm, with all finishers receiving T-shirts and medals and the foremost of them being awarded sports bags and shoes thanks to support from Asics. 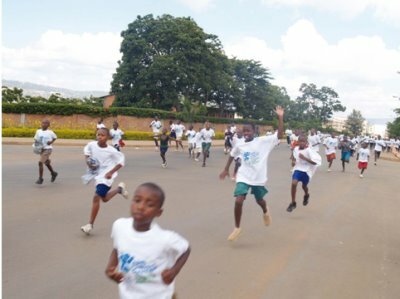 The other races in the AIMS Childrens Series 2008 will take place in Kigali (RWA) on 11 May and in Addis Ababa (ETH) on 29 November. 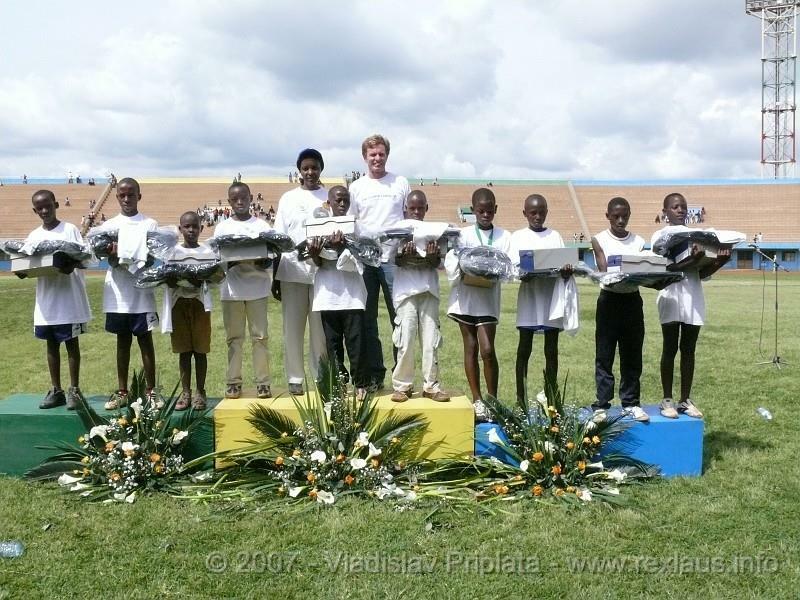 The final event in the AIMS Children's Series 2007 was again held in conjunction with the Great Ethiopian Run in Addis Ababa. It had been scheduled for 8 September to coincide with the Ethiopian Millennium celebrations, but at the late request of the Government was put back to the regular date, the last weekend in November. There were four Children's races held on 24 November: under 8's and under 11's for both girls and boys, but children as young as three took part, alongside their parents or brothers and sisters. Each race was over a 1km out-and-back course which started and finished in Meskel Square, a huge semi-circular space with raked terraces reminiscent of an amphitheatre. 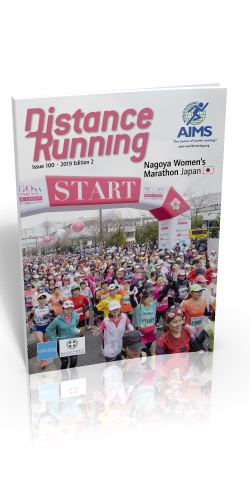 Apart from medals, T-shirts, snacks and drinks for all the first few finishers in each race won shoes and bags, in an initiative funded by charitable efforts of the Tokyo Marathon, initiated by ASICS. Ethiopian airlines also provided a race souvenir. 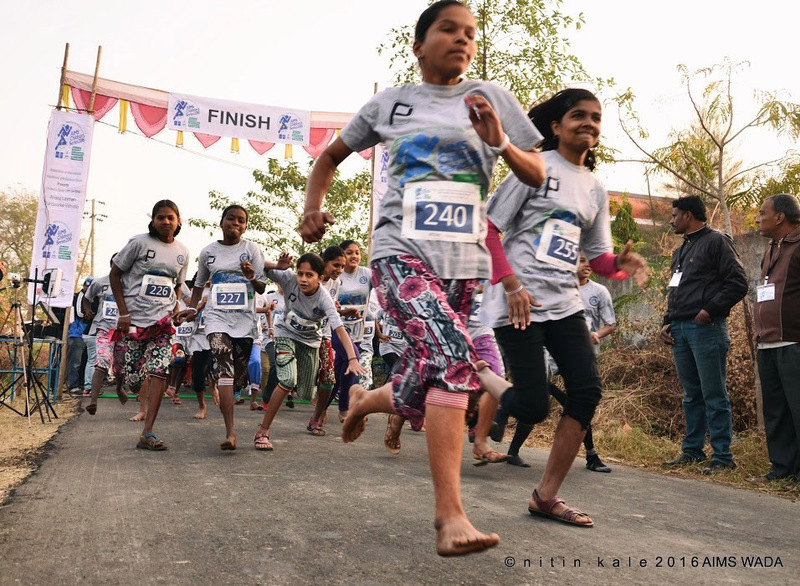 Race director Richard Nerurkar commented "I think this event is here to stay"
Because the Kathmandu race organisation has been disbanded, the second event in the series was replaced by a Children's race in Rwanda held on 13 May in conjunction with the Kigali Peace Marathon. They started from within the national stadium, and ran pell-mell for the exit gate to start their circuit of the surrounding streets in the outlying district of the Rwandan capital. The race attracted a lot of support from the crowd along the route. 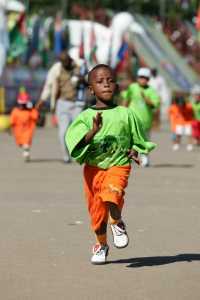 Young runners in the AIMS Children's Series 2007 at the Sahara Marathon, on 26 February. The final part of the lap involved circling the stadium on the road outside before entering the arena to run the final 300m on the track. Chip timing allowed easy identification of the category winners - and top 10 finishers in both boys and girls categories were presented with running shoes and sports bags supplied by courtesy of ASICS. The third event will again be in Addis Ababa. 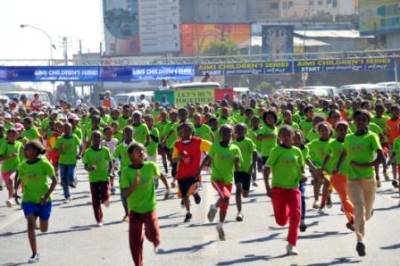 It had been scheduled for 8 September to coincide with the Ethiopian Millennium celebrations, but at the late request of the Government both the Children's races and the Great Ethiopian run were put back to the regular date, the last weekend in November. 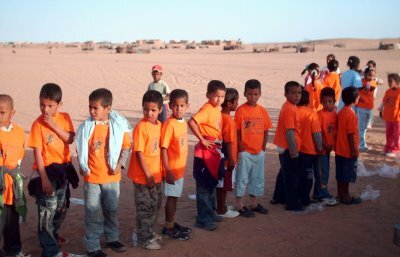 The 2007 series had again begun with the children's races held at the Sahara Marathon on 26 February. Held in conjunction with the Sahara Marathon for the second year, the Children's race was again a great success, even though controlling 1000 highly enthusiastic boys and girls is very difficult writes Mattia Durli. 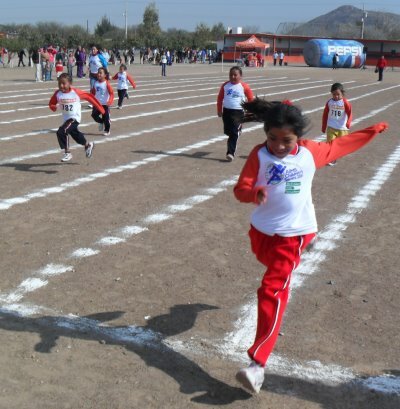 There were three races, of 300m, 500m and 800m, depending on the age of the children. T-shirts were distributed before and medals after the races, along with a small present for each runner. The second stage of the series took place in Nepal on 22 October 2006, in association with the Samsung Kathmandu 5km Peace Run. Setting off from the City Hall building, with the temples and stupas of Durbar Square in the background, the combined field created a long snaking trail along New Road, around Ratna Park and then eastward out to Baneshwor, to finish at the gates of the gigantic Birendra International Convention Centre. There were three age groups, each divided into boys’ and girls’ categories, identified by a letter code to pick them out at the finish line. The grounds of the convention centre gradually filled up with smiling runners, proudly wearing their medals and clutching their certificates as they tucked into their breakfast packs. 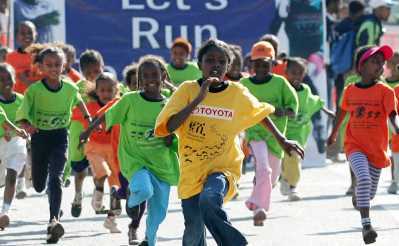 The AIMS Children’s Series for 2006 was rounded off in Addis Ababa on 25 November by a series of four separate races conducted the day before the 6th Toyota Great Ethiopian Run 10km. The size of the fields were limited in this inaugural edition to a total of 3000 runners split into boys and girls and into two age categories. In the under 8s some serious racing went on up front, but the tiny kids trailing in their wake ran the whole way. The start and finish were located in the huge amphitheatre surrounding Meskel Square. The course was 1200m in length, comprising a lap of Meskel Square and out-and-back section up a testing slope. In the under 11s girls’ race the first three finishers all ran barefoot. After the finish line each child was awarded a drink and a bottle, biscuits and a medal. Gradually the Square filled up with kids basking in the sunshine, laughing and chatting with friends and sporting the spoils of their participation. The top three in each category received plaques from a trio of distinguished athletes: Carolina Kluft, Sonia O’Sullivan and race patron Haile Gebrselassie.